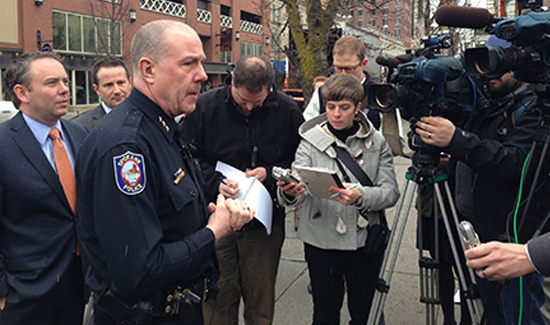 Spokane Police Chief Frank Straub suddenly resigned this week. His surprise move comes after trouble escalated for the embattled chief following a September meeting where some members of the Spokane Police Department submitted letters summarizing their concerns about his management style. According to a story on KREM.com, city leaders officials confirmed Straub will be reassigned to the City Attorney’s Office for now and will leave city employment for good on January 1, 2016. Many people came forward with specific examples of unprofessional and hostile behavior by Straub toward others. Leaders said the behavior dated back two years and included profanity, personal, degradation and “other behavior not becoming the office of Spokane Police Chief.” They said Straub’s conduct was demeaning and created a hostile work environment. Letters from the City Attorney’s Office also stated that SPD co-workers voiced concerns about a lack of communication, inefficient resource allocation, wasted time, unnecessary overtime, and general frustration. The SPD Lieutenants and Captains Association met September 17 with Assistant Police Chiefs Rick Dobrow and Shelby Smith, members of the Spokane Police Guild and human resources, for a regularly scheduled meeting. Concerns about Straub’s leadership were addressed again. The group listed witnessing emotional outbursts, personal attacks, threats regarding employment, scare tactics, degradation of character and highly inappropriate language.